Vikky Alexander’s black and white Island Series presents lush views from inside Palm House – deemed one of the most important surviving Victorian iron and glass structures in the world – at Kew Royal Botanical Gardens outside of London. Intended to house and exhibit plants of economic importance gathered from remote points of the British Empire, these abundant plants are almost as large as the edifice that contains them and have reclaimed the architecture that surrounds them. Stéphane La Rue’s most recent work is a suite of ten stunningly beautiful colour photographs titled Sols inapparents. 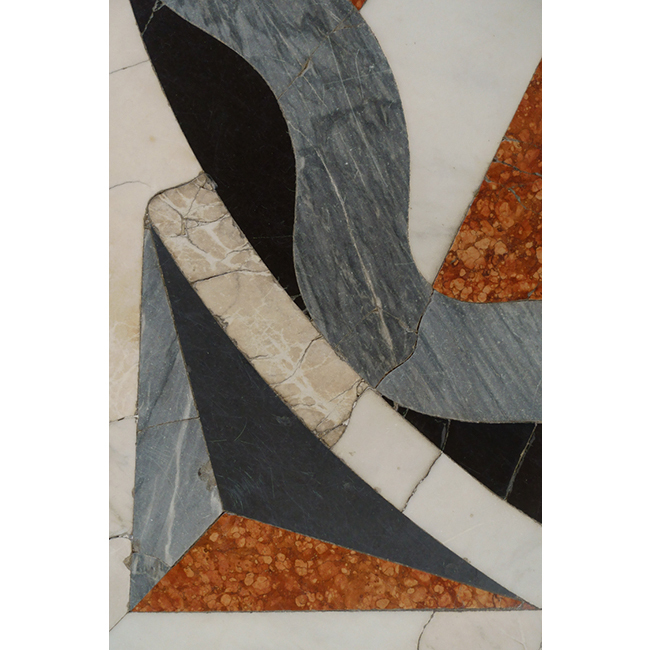 The genesis of this work came about during the artist’s six-month residency in Rome in 2018 where he became fascinated with the pavement stones of Roman churches. Using a camera rather than his sketchbook to document what he saw and experienced, Sols inapparents reveals itself to be an important locus of exploration. It renews La Rue’s pictorial language through photography by radically investigating illusionist space. La Rue’s photographic project continues to refer to painting, but to painting which, by rediscovering the world, takes it in hand and reinvents it. Danny Singer continues his epic photographic project with the presentation of six new large-scale works from his Main Street and Big Sky Series. The specific resonance of Singer’s photographs lies in the way he situates the subject matter as a site marked by a continual tension between place and space, between map and itinerary…. Singer’s work engages us with a sense of place that continues to reinforce historical moments, and a mythological sensibility in our perception of land and life on the Great Plains. Vikky Alexander was born in Victoria, British Columbia in 1959, and lives and works in Montréal, Québec. Her work explores the relationship between art, architecture, and nature, and in particular the modernist tendency for incorporating landscapes into buildings and the notion of domestic utopia. She is interested in how nature is experienced in a consumer society, which she investigates in her photographs of artificial environments. Her CV reflects a well-established career on both the national and international stages. In 2012, the National Gallery of Canada acquired an entire suite of photographs from Alexander’s The Island Series; it was subsequently shown at the National Gallery of Canada’s Biennial of Contemporary Canadian Art titled Builders that same year. This series was also shown as an installation at the Eaton Centre for the 2012 Nuit Blanche in Toronto. In March of 2018, Vikky Alexander: The Spoils of the Park, the artist’s first solo exhibition in the UK, opened at Canada House in London; and in July of 2019, the Vancouver Art Gallery will present the first major a survey of the artist’s work titled Vikky Alexander: Extreme Beauty. Alexander’s work is included in many prestigious collections in North America including the Museum of Contemporary Art, Los Angeles; the National Gallery of Canada; the Deste Foundation, Athens, Greece; and the Vancouver Art Gallery, to name a few. Stéphane La Rue was born in Montréal in 1968, and obtained his BFA from l’Université du Québec à Montréal in 1991, and an MFA from Concordia University in 1998. La Rue is part of a new generation of artists inquisitive about the re-investigation of formalist painting. His work has been in several solo exhibitions across Canada including at the Musée d’art contemporain de Montréal, Galeries Roger Bellemare et Christian Lambert, the Musée national des beaux-arts du Québec, and at the Foundation Guido Molinari, Montréal. He has participated in group exhibitions in New York City, Lyon (France) and Istanbul, and was featured in the Triennale québécoise in 2011 and the Canadian Biennial. In 2018, his work was included in the group exhibition Buveurs de quintessences at the Darling Foundation in Montréal; this exhibition is currently on view in Luxembourg at the Casino Luxembourg – Forum d’art contemporain. Danny Singer was born in 1945 Edmonton, Alberta, Singer began his career as a cameraman and director for the CBC. In 1970, he moved to Montréal, where he made the transition to still photography. Singer records places found in Canada’s western Prairie Provinces, and in the Great Plains of North America. Often composed of up to 80 or 100 sequential images digitally conjoined into seamless panoramas, Singer’s photographic works are eloquent, elegiac and nostalgic histories of small towns, villages, and hamlets. He is the recipient of a Canada Council mid-career grant, a British Columbia Arts Council grant, and the Hamber Foundation Award of Merit. He has exhibited in solo shows across Canada and in numerous group exhibitions such as Shore, Forest and Beyond, Art from the Audain Collection, Vancouver Art Gallery (2011), and Timeland: 2010 Alberta Biennial of Contemporary Art, Art Gallery of Alberta, Edmonton, Alberta (2010). His work can be found in private and public collections across the country including the National Gallery of Canada, the Vancouver Art Gallery, Glenbow Museum in Calgary, and the Mendel Art Gallery in Saskatoon, to name a few.